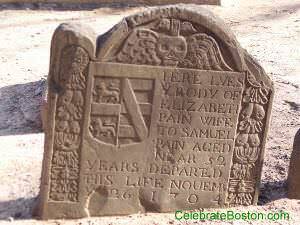 Elizabeth Pain is buried at King's Chapel Burying Ground. She died in 1704, and her grave is marked with a beautiful carved stone. It is believed that Nathaniel Hawthorne (1804-1864) was inspired by the shield on Elizabeth Pain's gravestone, and referred to it in his famous book The Scarlet Letter. Wikipedia summarizes The Scarlet Letter concisely: "Hester Prynne, the story's protagonist, is a young married woman whose husband was presumed to have been lost at sea on the journey to the New World. She begins a secret adulterous relationship with Arthur Dimmesdale, the highly regarded town minister, and becomes pregnant with a daughter, whom she names Pearl. She is then publicly vilified and forced to wear the scarlet letter 'A' on her clothing to identify her as an adulteress, but loyally refuses to reveal the identity of her lover. She accepts the punishment with grace and refuses to be defeated by the shame inflicted upon her by her society." "And, after many, many years, a new grave was delved, near an old and sunken one, in that burial ground beside which King's Chapel has since been built. It was near that old and sunken grave, yet with a space between, as if the dust of the two sleepers had no right to mingle. Yet one tombstone served for both. All around, there were monuments carved with armorial bearings; and on this simple slab of slate—as the curious investigator may still discern, and perplex himself with the purport—there appeared the semblance of an engraved escutcheon [a shield]." Elizabeth Pain's marker is what inspired Nathaniel Hawthorne in a passage, not her personal life (it was someone else). Hawthorne wrote about the conflicts of Puritanism, with artistic license. Records indicate that in 1674 a Boston town official admitted to committing "incontinence," and was levied a fine of 5 Pounds as punishment. Wearing a scarlet "A" was unlikely ever a punishment for adultery in Boston (although public drunkards at times were required to wear a "D" as a penalty). Hawthorne also appears to have borrowed Hester Prynne's name from William Prynne, an opponent of the Anglican Church in England in the 1600s, whose ears were cut off as punishment.